FLOWER GARDEN BETWEEN LODGE AND BARN AUGUST 2007. SPIDER WART, HOSTAS, DAY LILLIES, DAISIES, AND OTHER BEAUTIFUL FLOWERS BRIGHTEN UP THIS WONDERFUL FLOWER BED. 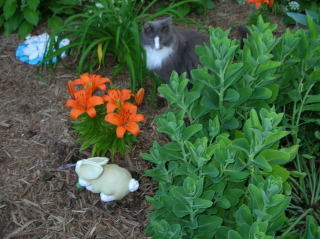 OUR CAT BOOTIE KEEPING THE LILLIES COMPANY IN ONE OF OUR FLOWER BEDS. VIEW FROM FRONT FLOWER BED, THRU SIDE FLOWER BED AND TO CABIN BESIDE MAIN LODGE. NOTE THE BEAUTIFUL WHITE ANGEL TRUMPHET VINE BLOOMS ALONG THE CABIN. THEY BLOOM HERE FROM LATE AUGUST AND ON INTO OCTOBER.